Want to Win $979 from 97.9 The Hill & Chapelboro.com? 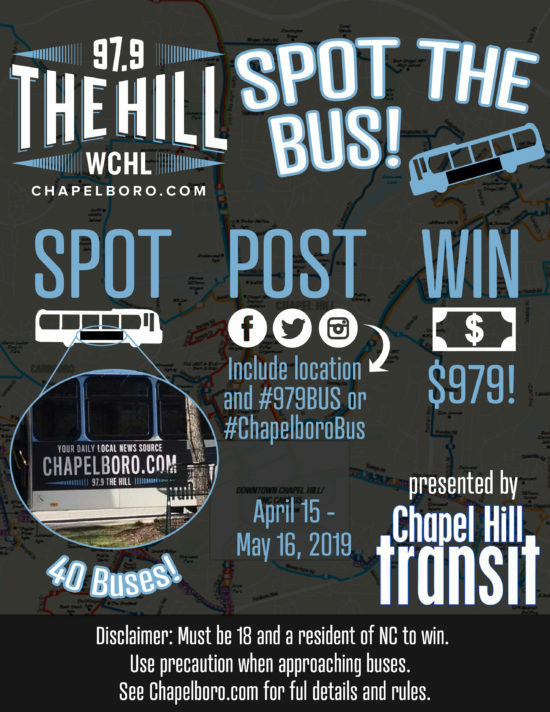 It’s easy with Spot the Bus, presented by Chapel Hill Transit! Look for the Chapelboro.com or 97.9 The Hill ads on 40 buses around town and snap a photo or selfie of the ad on the bus. Post it to Twitter, Instagram or Facebook with your location using #chapelborobus or #979bus. Post a new photo every day through May 16th for more chances to win! Keep listening local to 97.9 The Hill and keep up with all the trending news and events with Chapelboro.com to win more great prizes like this! *The winner must be at least 18 years old and a resident of North Carolina. See full Contest Rules for more information. Use precaution when approaching buses. Congratulations to Eunice, who won $979 cash during the Fall of 2018 with this post from September 27th!